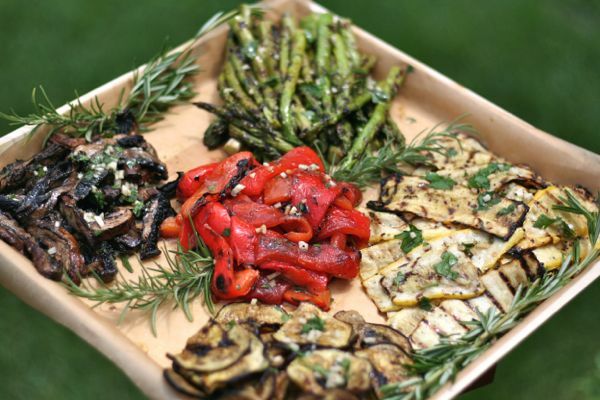 With a slightly smoky aroma and a great variety of textures and bright colors, grilled vegetable platters are always a delicious addition to any meal. 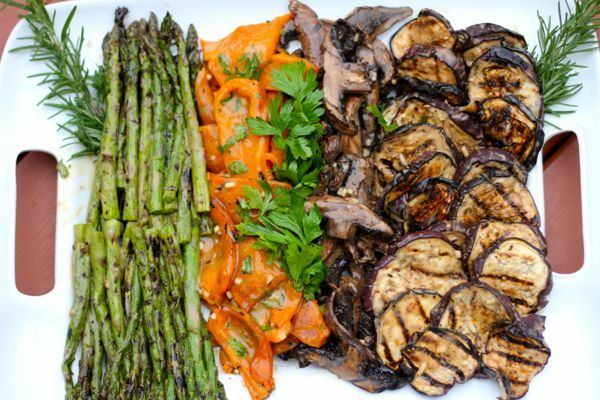 Vegetables can be grilled by placing them directly on the grill grates, just be sure there is some type of nonstick spray used to prevent them from sticking. Some use a grill basket or foil pouch for vegetable grilling. Just be sure not to overcrowd or the vegetables will steam instead of keeping a bit of crispness. A little toss in olive oil before grilling helps prevent vegetables from drying out. Too much oil adds unnecessary calories and can also cause flare ups in the grill. Denser vegetables do take longer to cook. Bamboo skewers that have been soaked in water first are good for smaller vegetables like cherry tomatoes and mushrooms. Get creative and use any vegetables you have on hand. The key to getting nice grill marks on vegetables is not to shift them around too much during the cooking process. Vegetables are low in calories but high in fiber and are important sources of many nutrients, including potassium, folate (folic acid), vitamin A, and vitamin C.
Gently toss the vegetables in a large bowl with the olive oil, balsamic vinegar, oregano and a dash of salt and pepper for a very thin coating. Prepare the main vinaigrette to use after grilling by placing all ingredients in a mason jar, close with the lid and shake vigorously. Spray the grill carefully with nonstick cooking spray between each set of vegetables so that the vegetables will not stick. Grill the peppers, skin side down and without turning, until blackened and blistered, about 5-8 minutes and then turn them over to brown the underside briefly for another 2 minutes and remove from the heat and let sit just briefly. While still warm, place the peppers in a brown paper bag or plastic Ziploc bag and let stand until the skins loosen and then peel the skin off the peppers (sometimes the charred skin does not need this step and you can simply peel the charred skin off). While peppers are cooling, grill the remaining vegetables. Grill the eggplants until golden brown with nice grill marks and tender, about 5 minutes per side. Grill the zucchini about 5-6 minutes and then the mushrooms until they are nicely charred and tender, about 3 or 4 minutes per side. After shaking the vinaigrette one last time in the jar, pour the vinaigrette into a large bowl and working with one type of vegetable at a time, toss into the bowl to gently coat. 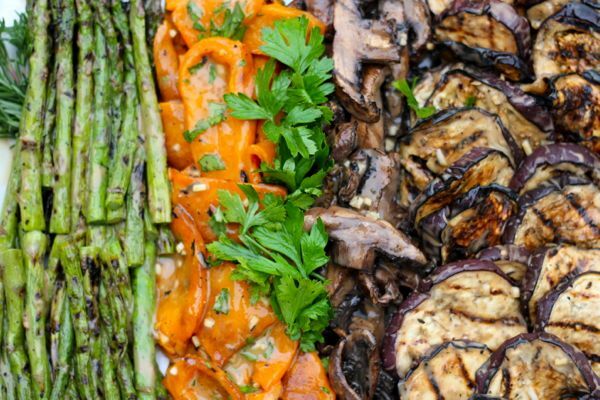 This step is done as some grilled vegetables are more delicate than others. Arrange vegetables on platter and drizzle with any remaining vinaigrette.